Texans WR Demaryius Thomas’s season is over. 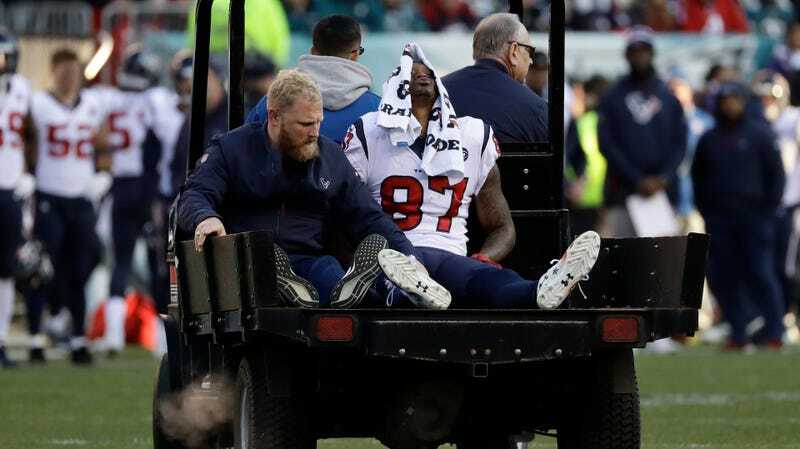 In the fourth quarter of the Texans game against the Eagles, Thomas crumpled to the ground in agony after planting his left foot, and he had to be taken off the field on a cart. Because it was a non-contact injury, he seemed to know how bad it was immediately, as he punched the ground in pain. Ian Rapoport reported the ominous news. The Texans receiving corps has been severely banged up this season, with Will Fuller already out with a torn ACL. Thomas logged 275 yards in his seven games with the Texans this season.